Seiritsu International Education: How about becoming a host family ? How about becoming a host family ? There are many good host family programs. 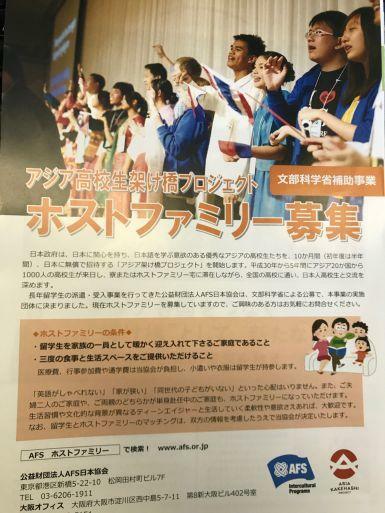 At Seiritsu we use Homestay in Japan but we are now looking at this program too. It is linked with the government through AFS. If you are thinking about possibly being a host family, there are two typical patterns: being a short term host family, or being a long term family. It is probably easier and better to start as a short term family. If so, we recommend contacting Homestay in Japan. If you have done it before and are looking at being a long term family, how about checking out this program? It looks like it could be a fantastic opportunity.